It looked like there was going to be a $9,800 penalty for me to pay on my income taxes this year. When your accountant tells you that, it takes a minute to catch your breath. Let me tell you the story and it will include some dollar amounts that really are none of your business, but it makes the story better. So, I will tell them because a good story is so important.Turned in my tax folder with the itemized items to Dianne Roberts in good time and she got them quickly. Then she called me and asked if she could bring them by the office. I love that lady. She realizes that if I leave the office, then it gets locked up and there’s nobody to answer the phone – which really isn’t good thing for someone trying to call. I don’t think that irritating computer voice from Google that calls me more than any family member really cares. Dianne Roberts gave me the news that the taxes looked regular and normal until it came to the point where my income was over what was reported for me to get the affordable insurance for those of us that don’t make all that much money. And that caused the $9,800 penalty.Now, I don’t cheat on my taxes because I am afraid of the IRS. They have way too much power and nobody that oversees them. My imagination has them coming to me and saying that with the donation of a couple of kidneys, a liver, heart, and corneas I’ll be free and clear with them and they won’t slap a lien on the property I, my parents, my children’s and my best friend own. So, I do my best to be accurate and on time. fter my wonderful accountant gave me the penalty news, I asked her if I could copy that part of the taxes and go talk to Dianna Brown, who does my insurance. Dianne Roberts was very happy that I would go and do that, so at 8:30 in the morning when Brown and Associates opened their door the next morning, I was walking into Dianna Browns office. It took Dianna Brown just a moment to look at the papers, find something on the computer and print it off, telling me that we hadn’t messed up on the insurance and income deal and would I drop these papers off at Roberts and Keenan for them to see. Sure, I would. Then Dianna and Dianne visited. It is so much better to get the smart ones to talk and let me just write my column while they figure this out. I had nothing to add to the conversation other than the fact that I might need a paper bag when on the verge of hyperventilating. OK, maybe I am exaggerating, but it could have happened. Seems that the W-2 from my Edward Jones stocks and whatever else Kyle Hawkins does with that money had shown a profit. That’s what he’s supposed to do, right? Make money for me? Because, you know, it is a fact that when you get old and don’t work anymore people still expect you to pay your bills. Narrow minded, but true. The $4,000 that was reported income from Edward Jones put me $24 or some such over on my allowable income for the insurance. Thus the $9,800 penalty. This is not a joke. Nor was it funny at the time. So, Dianna Brown asked me if she could go visit with Kyle. You bet. And then Kyle calls and asks if it is allowable for him to visit with Dianna about my Edward Jones stuff. Heavens, yes, and they visit. Kyle does some switching and rearranging, all perfectly legal, because I’m likely not the only person this sort of nightmare has happened to. Dianna calls me and gives me the good news. Dianne calls and gives me the good news. Kyle calls and gives me the good news and explains what needs to happen. And the penalty goes away. I can keep my kidney or whatever organ is worth that many thousands of dollars that I was going to owe to the IRS. Pretty sure my Hardy Boys collection of books wasn’t going to cut it if they went on the market.And now let’s look at this whole incident in a different way. Thank God I have an accountant that got my taxes done in a timely manner. Thank God I have an insurance agent who is just down the street and has time to listen to me and then advocate for me. Thank God my money guy is right here in Guymon, wasn’t a long distance number and five hours holding on the phone away. And he brought the papers to me to sign and sits down with the patience to explain everything to me. In fact, he’ll explain it again if he needs to, until I understand.Whether your insurance agent is Warner McKinnon or Ken Lane or Charles White or Garrison. They are here, seeing us at church and at Rotary and other places around town. They will work for you because they care. Whether your accountant is Elgie Davis or Peggy Keenan or whomever, the same goes for them. And if your investments are handled by Mitch Egger or Kyle, they will work with you even if it is a really small amount of money because they want your life to be good. Don’t tell me shopping online can save you $100 … if I had done that it probably would have cost me $9,800 to save that $100. Certainly, I wouldn’t have figured out how to fix it because I don’t know those things and I was busy doing my own work. But because they cared, the three put the puzzle together and owe them. If you’re smart and think you and your family are worth what is best for your future, you’ll do it. Whether it’s buying your office supplies here (and having them deliver them in a day or less … and while Gabe Dixon is here, he’ll also put the toner in my machine because that’s just how he is); getting your insurance from a local agent; having your cell phone through a carrier that sponsors you kids t-ball teams and supports school clubs and events; buying your Christmas presents from the local boutiques and stores … heck, you should check out the cool things in the lumber yard that people don’t realize they have; it makes a difference in your family’s life. It makes a difference in your neighbor’s world. It makes a difference in the world of those you go to church with. It makes a difference. For me, in March of this year, it made $9,000 worth of difference … and a happy kidney, to boot. 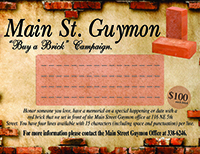 See you on the bricks … living local!